New Jersey crowned one national champion, broke a state record, shattered multiple county records, and threw down several sizzling times on the second day of the New Balance Nationals on Saturday at Aggie Stadium on the campus of North Carolina A&T in Greensboro, N.C.
Two of the biggest NJ highlights came in the shuttle hurdles. East Orange won its second straight boys shuttle hurdle title with a time of 56.86, just off the meet and state record of 56.54 set in 2013 by Union Catholic. In the girls shuttles, Union Catholic took down its own state record with its fourth-place time of 58.30, breaking its state record of 58.38 set in 2015. 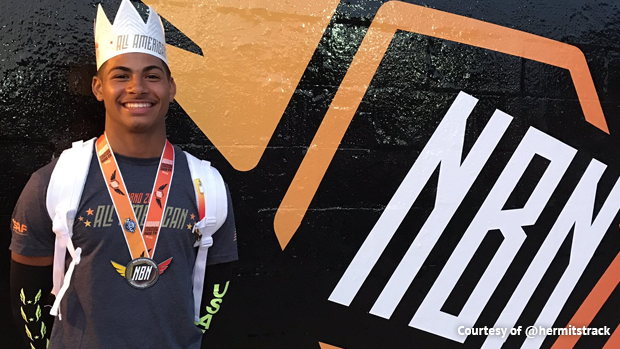 There were several other sensational performances by NJ athletes and relay teams. The Winslow girls ran a sizzling NJ #4 all-time 1:38.43 to place second in the 4x200, and Piscataway was seventh in 1:40.65. St. Benedict's Prep blasted a NJ #3 all-time 7:35.87 to place fourth in the boys 4x800. Hopewell Valley, which received a huge 1:49.82 anchor carry from junior Sean Dolan, finished sixth in 7:41.84. St, Benedict's lineup consisted of Jackson Burnett (1:54.31), Lewis Ngwenya (1:52.43), Ronald Kigen (1:56.99), and Alfred Chawonza (1:52.16). 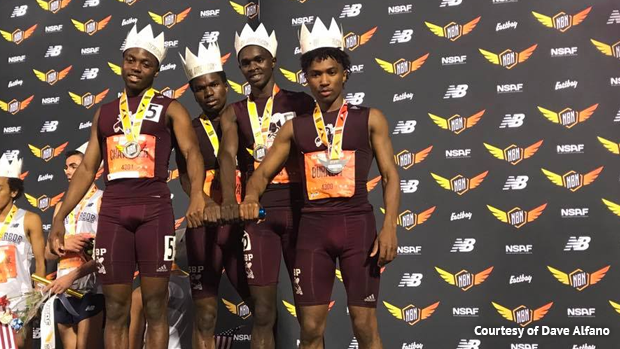 The only teams in state history to run faster in the 4x800 than St. Benedict's Prep are Morris Hills, a state record 7:31.60 at the 2009 Penn Relays, and Christian Brothers Academy, which ran 7:34.67 to win the 2012 NB National title. Seton Hall Prep burned a 1:26.59 to take second in the boys 4x200, which equaled the NJ #1 time run by East Orange at the Bulldog Invit. in Potomac, Md. in April. Sincere Rhea of St Augustine finished fourth in the 110 hurdles in 13.96 (13.84 in the trials). C.J. Licata of Gill St. Bernard's, the Meet of Champions winner in the shot put, unloaded a PR of 65-1 1/2 to break the Somerset County record and place sixth in the boys shot put. The former Somerset County mark of 64-7 1/2 was set by Chris Staten of Franklin when he won the 2012 Meet of Champions. Woodbridge dropped a NJ #1 and Middlesex County record 4:01.90 to place sixth in the girls SMR. The former Middlesex County record of 4:02.36 was set by Piscataway in 2006. The Rahway boys ran 58.91 to place fourth in the boys shuttle hurdles. 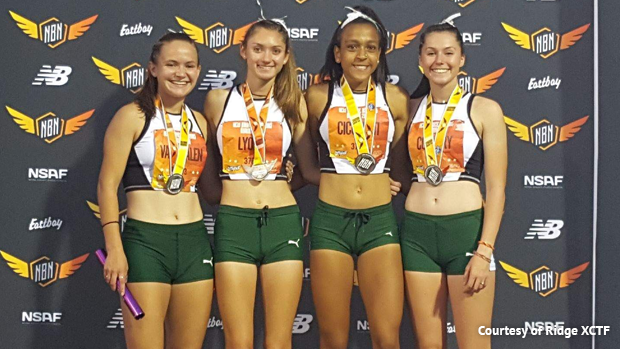 The Ridge girls ran a NJ #1 9:01.51 to place fifth in the 4x800. Hayley Horvath of Notre Dame, the state record holder in the girls pole vault, finished eight at 12-6 1/4. Nick Mirabelli of Rancocas Valley, the state record holder in the boys javelin, was third with a 212-5. The Union Catholic boys ran a NJ #1 3:28.61 to place fifth in the SMR, and West Orange was 8th in a NJ #2 3:28.97. Union Catholic was ninth in the girls SMR in a NJ #2 4:03.66, and Pope John 10th in a NJ #3 4:03.74. UC also ran a NJ #4 47.38 to place ninth in the girls 4x100, and the Deptford boys ran 41.83 to place ninth in the 4x100.